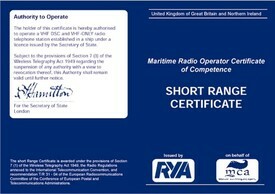 Do you have an old VHF Short Range Radio Certificate (SRC)? If your VHF certificate was issued prior to the introduction of GMDSS (Global Marine Distress & Safety System) and DSC (Digital Selective Calling) you may need to upgrade your VHF certificate. How do I know if I have the right VHF licence? If your SRC VHF radio licence was issued prior to 1999 it only allows use of non-DSC VHF radios. Why is it important to be able to operate a DSC radio? Most vessels are now fitted with DSC VHF radios which must be operated, or supervised, by a holder of a full DSC SRC VHF radio licence. All new VHF radio sets are either fitted with or can be interfaced to DSC. This significantly restricts the availability of non DSC VHF radios and availability will only decline going forward. Should a DSC transmission be initiated, the radio will automatically and immediately provide a vessel’s identification. As long as location information is input to a DSC VHF Radio, or it is interfaced to a GPS system (or the radio contains its own GPS facility) it will also provide the vessel’s location alongside the vessels identity. This information is transmitted on an individual non-voice channel thereby significantly reducing the possibility of interference from other VHF radio users. All of the above improves the potential speed of rescue should the situation arise. DSC also allows a call to be made to another vessel or shore base without the use of channel 16, thereby reducing traffic on this busy calling channel. DSC VHF radios achieve this by allowing another radio’s MMSI (unique identification number) to be used to call the vessel directly. If the call to the target MMSI is acknowledged the conversation can go directly to a working channel. How do I upgrade my SRC VHF Licence? INDI Skills is one of a number of RYA training centres that provide SRC VHF radio training. RYA VHF courses result in a full UK DSC SRC VHF radio licence upon successful completion of the course exam. INDI Skills,based near Cumbernauld, Glasgow in Scotland, provide both classroom and on-line VHF Radio training as well as the mandatory face to face examination and is convenient for those in the Scottish Central Belt and surrounding areas. INDI Skills can also provide on-line VHF courses throughout the UK. You can find out more about our RYA SRC VHF Radio courses by following this link to our VHF training page or by visiting our online VHF course page.